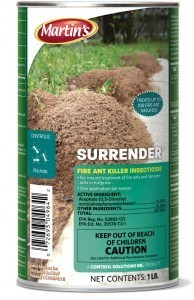 PRODUCT DESCRIPTION: White gray powder which is used by sprinkling it over ant mounds found in the yard and garden. TARGET PESTS: Though the labeling lists just "ants", acephate is active on many lawn and garden pests when used as the label allows. So sprinkling some over ant mounds, mole cricket nests, digger wasp holes, cicada killer tunnels and basically any pest found in the yard or garden will provide positive results. It will even get rid of stubborn crawfish too. WHERE TO USE IT: In the lawn, pine straw beds, mulch islands, flower beds and landscaped islands where nuisance pests are located around the home. RATE OF APPLICATION: 2-3 teaspoons per mound or castle; each jar will cover around 48 mounds. To general treatments, use 2 oz per 1,000 sq/ft or 1 can per 8,000 sq/ft using our HOSE END SPRAYER to make the application. works well if you can catch then building their tunnels. went from 4 dozen hills 3 years ago to 6-8 this year. it takes time but works. don't spill it where u don't need to. and it smells bad too.